This is a seasonal, tasty and nutritious salad that can be eaten raw or as a warm salad. 1 small green cabbage cut into thin slices. I like the Cape Horn cabbage variety (also known as Sweetheart or Conehead cabbage) because it is sweet and has a mild flavour. Other varieties can be used too. Cut the cabbage into thin slices about 1cm wide. If you prefer not to have it raw, either blanch it in boiling water for 3-5 minutes or sauté the slices in some olive oil, until tender but not too soft – it must retain its bright green colour. Set aside until cool. In a flat pan or a roasting pan for the oven, dry roast the nuts until golden – watch them carefully since they can brown quickly. Set aside until cool. 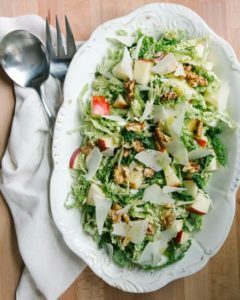 Dress the plate with the cabbage, slices of pear, walnuts, croutons, slices of pecorino cheese and pomegranate seeds. Make a vinaigrette by mixing the olive oil, pomegranate vinegar and molasses until all ingredients are well mixed. Sprinkle the vinaigrette onto the salad and mix well ensuring all leaves are covered. Et voila!